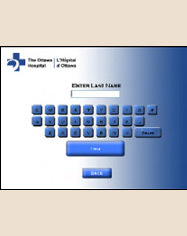 In 2002-2003 we were asked to address a growing set of issues with the traditional, third party baby photography services within The Ottawa Hospital (TOH) in the face of shorter stays and an emphasis on breast feeding and given, rising risks to privacy, security and exposure to communicable diseases. 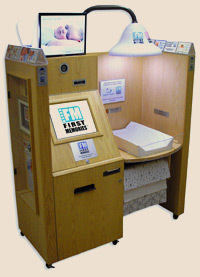 A self-serve, interactive baby photography kiosk was deemed to be the answer. A prototype was developed and placed into a pilot program at each of the General and Civic Campuses. All graphics and collateral materials for marketing and web deployment requirements. 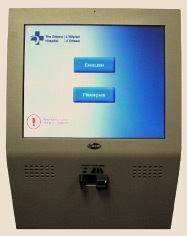 The Ottawa Hospital Nurses Residence Corporation required an entry kiosk system which we designed, prototyped and deployed in record time. 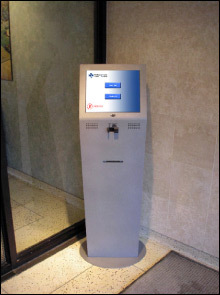 The entry kiosk is a unique system allowing users to locate a tenant, and call them directly to gain access to the building. Small or large, each project gets full attention to detail, from start to finish and ongoing support. We work closely with clients to recognize all specific deliverables and milestones which are met on schedule and on budget. Creative, compelling, user friendly designs, cleanly executed. © 1991 DB Studio. All rights reserved.